My religious tradition doesn't recognize or celebrate the liturgical year. We occasionally notice Easter and Christmas, if only to preach against them. But my experiences with The Book of Common Prayer are pulling me deeper into the rhythms of the liturgical calender. What follows are some basics for people wholly unfamiliar with the ebb and flow of the liturgical year. There are four holy seasons: Advent, Christmas, Lent and Easter. Outside of these holy seasons is what is called Ordinary Time. 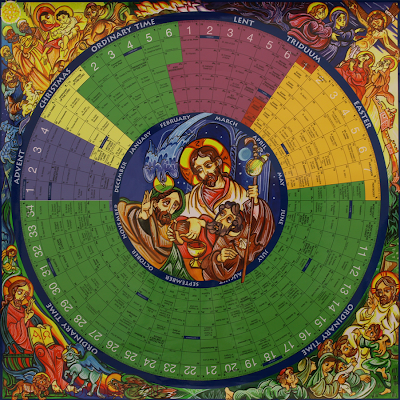 There are two periods of Ordinary Time (these are the green weeks in the wheel above; the liturgical color for Ordinary Time is green). The first period is short, marking the weeks between the end of Christmastide and the start of Lent. The second period of Ordinary Time is longer, taking up about half the secular year. This period goes from Pentecost (the end of the Easter season) to the start of the Advent season. The liturgical year starts with Advent. Advent starts four Sundays before Christmas Eve. Christmastide begins on Christmas Eve and ends on Epiphany (January 5th). Christmastide is also called the Twelve Days of Christmas. As seen above, a liturgical color for Advent is blue. Gold is a color for Christmastide. After Epiphany Ordinary Time begins. Again, the liturgical color for Ordinary Time is green. On Ash Wednesday the season of Lent begins. A liturgical color for Lent is violet, or a rose color. Lent goes until the Easter Tiduum, which starts on the evening of Maudy Thrusday, through Good Friday and Holy Saturday to Easter. As these days relate to the Passion, a liturgical color is red. Eastertide, the final holy season of the year, starts on Easter and ends on Pentecost, the 50th day after Easter. A liturgical color for Eastertide is gold. After Pentecost the Sundays are simply numbered (1st Sunday after Pentecost, 2nd Sunday after Pentecost, etc.) until the liturgical year starts again with the Advent season. Finally, sprinkled throughout the liturgical year are a large number of Holy Days, the most important being the Solemnities (many of which we have already mentioned but include days like the Annunciation, the Ascension, Trinity Sunday, and All Saints) . So, enjoy the Easter season. The celebration isn't over yet. It lasts until Pentecost. Question: what version of the Book of Common Prayer do you own? I've been thinking about getting one and I don't want to end up with one I can't read without stumbling over old english. Thanks! This is the version I have: The Book of Common Prayer. It's the 1979 edition used by the Episcopal Church. I've found the liturgical calendar to be a wonderful aid for worship and I find the rhythm of it helpful for integrating Christianity into my whole life. Although modern culture is constantly shifting, ancient traditions like the liturgical calendar help me keep my perspective. I personally feel that certain parts of the liturgy help keep my faith grounded amidst the many worship fads that hit churches all too often. Looking forward to picking up a Book of Common Prayer at your suggestion. Don't forget the Eastern Church has its own liturgical structure, based on the Twelve Great Feasts which flow from and to the Paschal Feast of the Resurrection. Many places of congruity with the western version, but also many differences. Hi, would you mind sharing where you found that particular image? The calendar is beautiful. I handle the altar for our church, and this calendar/image looks like a great reference throughout the year. Do you know of a pre-Vatican II liturgical year calendar graphic like the one you show here? A distinctive feature of the pre-Vatican II calendar is that there is no "Ordinary Time", most of which was called "Time after Pentecost."